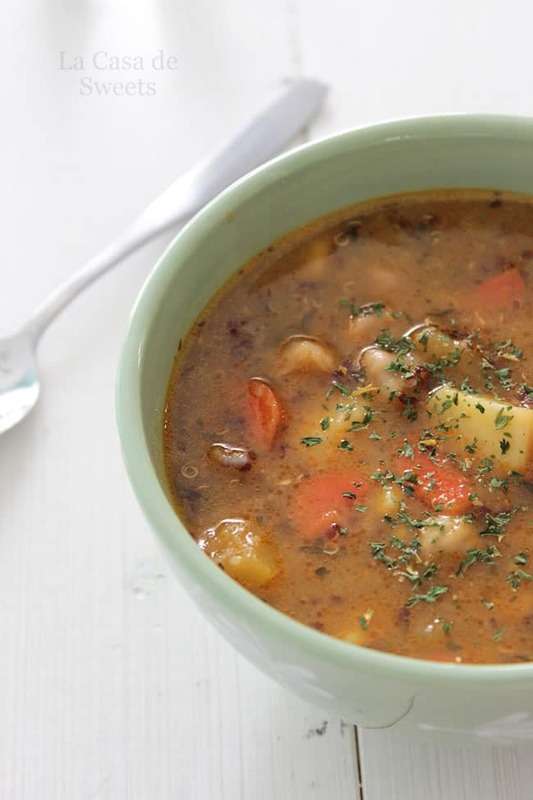 This winter vegetable soup recipe was inspired by a recent trip to the farmers market. With tons of local squashes and root vegetables on display, vegetable soup came to mind. I added garbanzo beans and quinoa to make it heartier (and even healthier! ), but you can leave those out, or make a few substitutions. Eating healthy food should taste good, it just doesn’t have to take you ages to make! 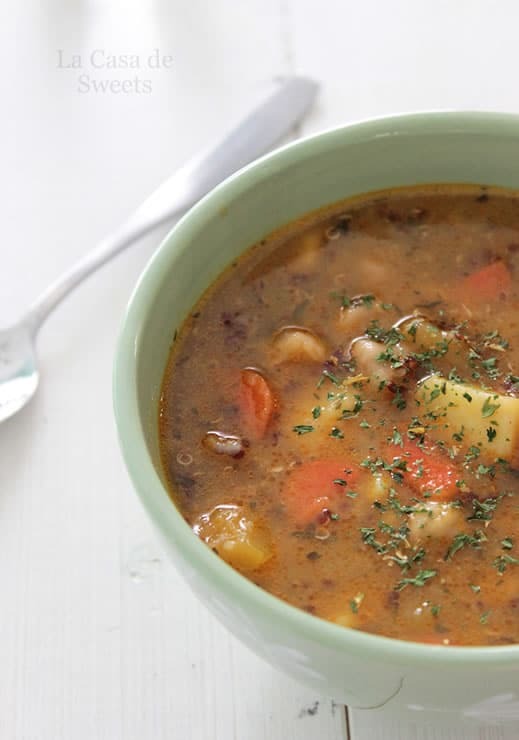 This winter vegetable soup recipe was inspired by a recent trip to the farmers market. In a large pot, combine the minced garlic, olive oil, and the chopped vegetables. Stir to combine, and cook over medium-high heat until the vegetables start to soften, about 6-8 minutes. Stir in the vegetable broth, water, parsley, and a few pinches of salt and pepper. Bring the soup to a boil, then partially cover the pot and simmer on medium heat until the vegetables are fork-tender, about 20 minutes. Taste the soup and add a few more pinches of salt, if needed. Stir in the cooked garbanzo beans and quinoa, and cook for an additional 5 minutes. Serve and enjoy! Jackie Gonzalez-Feezer is the recipe developer and photographer behind La Casa de Sweets, where she shares her grain-free and (mostly) vegan recipes. Having made the switch to a grain-free lifestyle a few years ago, her goal is to make healthy food taste good. You can also find Jackie on Facebook, Twitter, and Instagram. I am going to use chicken broth instead of vegetable, even though I know that won’t be vegan. It look healthy and yummy. Thanks for sharing your post. Keep sharing. Yumm.. thanks for sharing.. i will be making this.. Though I am just going to put in all in crock pot and let it cook slow. This one looks really yummy. I’ve been trying to find ways to incorporate more quinoa into our menu, and this looks like a good option!